Just about every day, Rachel Wiseman, AB’12, posts yet more cat photos and videos on Facebook. 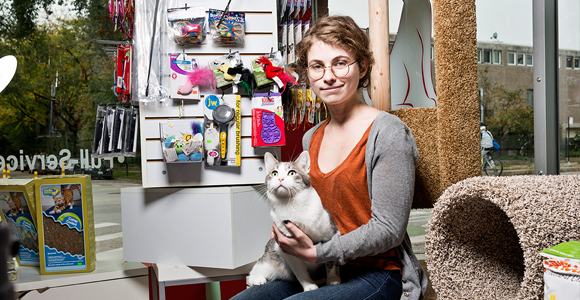 Rachel Wiseman, AB’12, a volunteer for Hyde Park Cats, helps find permanent homes for foster cats. It’s similar to her job in marketing at the University of Chicago Press, she says, except she posts about cats, not journals. Hyde Park Cats, founded in 2008 by Divinity School staff members Terren Wein and Mary Jean Kraybill, AM’81, was originally dedicated to feral cats. Early members fed alley cats and controlled their population through a procedure called TNR (trap-neuter-release). The all-volunteer group now has 30 members who foster potential adoptees, feed and care for ferals, and help socialize cats, dogs, and rabbits at a local animal shelter. A friend of mine was fostering this cat who was really sweet, but she was a little bit clingy, so he thought she would do well with another cat. Hyde Park Cats gave him another foster cat, Brian, and he didn’t want anything to do with her. One day I was hanging out with them, and she was just cowering in a corner. So I said I would take Brian. I had him for a long time—five months or something. I’d never had a cat before. What was it like to give him up? It was difficult, but I knew that the adopter would be really good for him. It’s gotten a little easier since then. I’ve had three foster cats so far—Brian, Trevie, and now Cordelia. You also rescued some kittens on the Midway, right? A colleague saw some teenagers drive up, get out of the car, and dump a pair of tiny black kittens by the Metra tracks before running away, laughing. Abandoning pets is, by the way, totally illegal and for most cats is a death sentence. We hastily emptied out a computer paper package and took the cardboard box with us. Now Millie and Pidge—that’s what I’ve named them—are camped out in my bathroom. They have to be isolated from Cordelia until they’ve been tested for some feline diseases. Is it true that people still have superstitions about black cats? Black cats are much less likely to get adopted than cats of other colors. They also more frequently suffer from abuse and neglect, especially around Halloween. How does Hyde Park Cats work if it doesn’t have a shelter? HPC runs through e-mail, essentially, and posting on the Facebook page and the website. For a long time, when I was fostering, I had never met the core volunteers. It’s a good model for a rescue group. When cats are sitting in cages at shelters, they’re not learning the social skills they need to be good pets. It’s been a pleasure to be able to see the changes in my foster cats’ behavior as they learn to trust people. They become much more affectionate. You didn’t have cats growing up? My dad is allergic. I had a dog. So are you a crazy cat lady now? I’ve been impressed with how not-crazy-cat-lady most of the Hyde Park Cats people are. First, we’re not all ladies. Second, people do this because they care about the community. We’re trying to get feral cats off the street. It goes beyond hanging out with cats and posting cutesy videos. However, I do try to take advantage of the Internet obsession with cats. What is it with the Internet and cats? I’m sure there are cultural theorists out there working on this right now. Cats are very photogenic and telegenic. Also cats have kind of a weird psyche. You want to get into their brains and know what they’re thinking. Why foster a cat, rather than just adopt? It’s a wonderful way to feel the love a pet can give you without having to commit to an animal for 20 years. For someone like me, who’s never had a cat before, it’s a good way to figure out if you love them—which I guess I do.